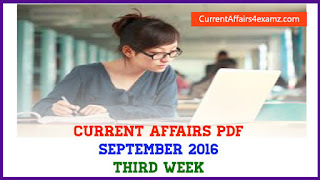 Hi Aspirants, here is the Current Affairs Quiz for 15 August 2016. Questions will be very useful for all upcoming Banking, UPSC, SSC, PSC Exams etc. 1. Union Government has constituted a National Committee on Trade Facilitation (NCTF) to develop the pan-India road map for trade facilitation. It will be headed by? Answer: Pradeep Kumar Sinha, Cabinet Secretary of India. 2. Which bank has recently launch an Unstructured Supplementary Service Data (USSD) based *99# mobile application for their customers for basic banking needs? Note: It was launched in partnership with National Payments Corporation of India (NPCI), the umbrella organisation for all retail payments system in the country. 3. India’s first ever BIO-CNG plant producing CNG (Compressed Natural Gas) from agricultural residue was recently inaugurated at? 4. Who was recently appointed as the new Chief Justice of the Bombay High Court? Note: She will succeed CJ Dhirendra Hiralal Waghela who retires on August 24, 2016. She will be second woman Chief Justice of the Bombay HC, after Sujata Manohar in 1994. 5. Govt has conferred Shaurya Chakra posthumously to Lt. Col. E.K. Niranjan of the National Security Guard. Shaurya Chakra is the ___ highest peacetime gallantry medal of the country? Note: Lt. Col. E.K. Niranjan was killed while defusing a grenade at the scene of the terror attack at Pathankot IAF base in January 2016. 6. Havildar Hangpan Dada has been posthumously honoured with Ashok Chakra on the eve of Independence Day. Ashoka Chakra is the country’s highest award for gallantry during? Note: Dada had shown exemplary courage, devotion & gallantry beyond the call of duty during an encounter with a group of terrorists in J&K. 7. Jharkhand government has recently introduced the e-POS (electronic point of sale) system. Jharkhand has become only ___ State in country to have their PDS system digitised? 8. Who won the Gold Medal in the 100m men's Final of Rio Olympics 2016? Note: Bolt recorded his season best time of 9.81 seconds. American Justin Gatlin settled for a Silver with a time of 9.89 sec & Canada’s Andre De Grasse finishing 3rd. 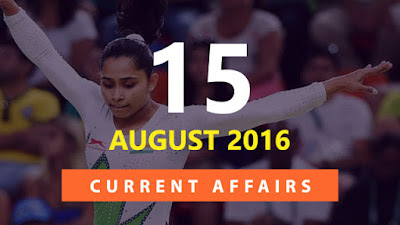 9. Who recently created history by producing the best-ever performance by an Indian gymnast in the Olympics history? Note: Dipa finished 4th in the women’s vault finals in the Rio. The gold was won by American Simone Biles (15.966). 10. As announced by Union Government on 14 August 2016, the ___ year-old practice of presenting a separate Rail Budget is set to come to an end from the next financial year? Note: The Finance Ministry accepted Railway Minister Suresh Prabhu’s proposal to merge Rail Budget with the General Budget.